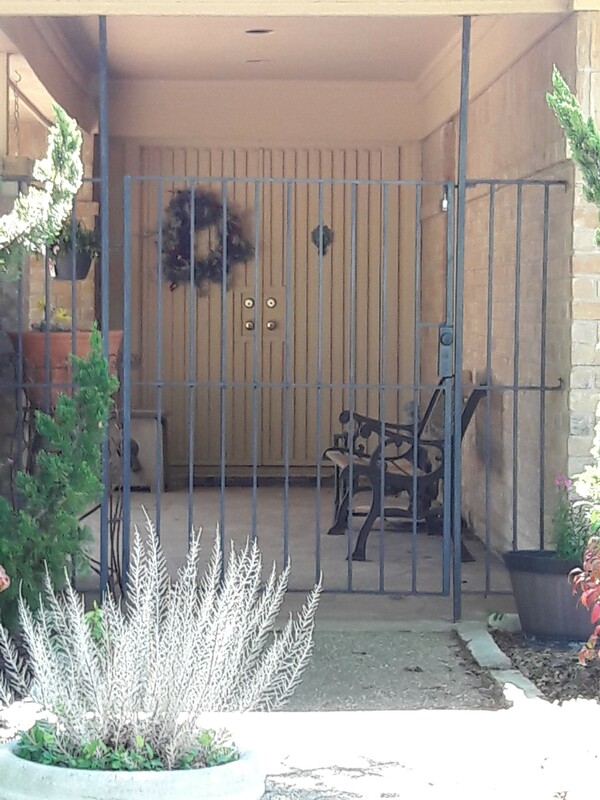 One solution to door-dashing is to install a doggy playpen and gate outside your front door. Make sure the door or the gate is closed at all times. If your dog is a door dasher, a dog that runs out the front door, side gate, or garage door, then teach your dog to “Wait” at the door, gate, etc. Remove the reward of the behavior you don’t like. Teach your dog the behavior you want it TO DO instead. Step #1 is, Remove the reward of the behavior you don’t like. How? 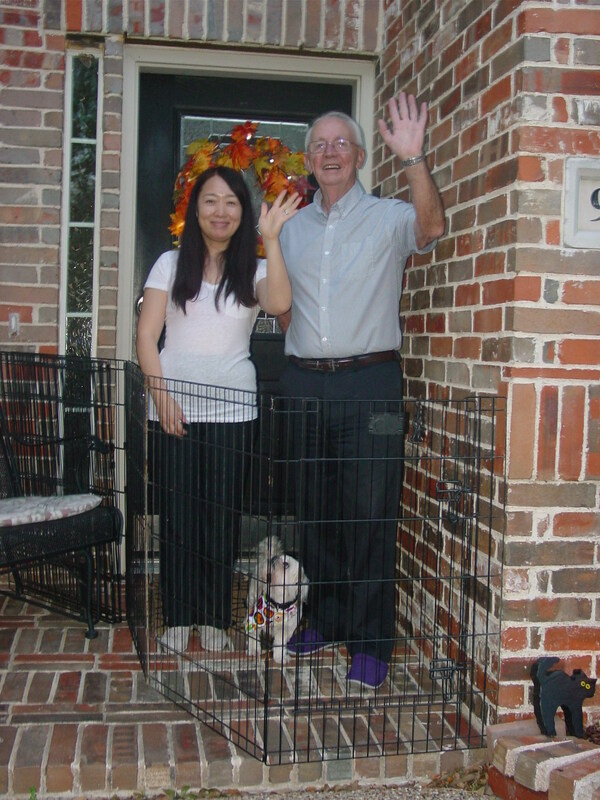 Another solution to door-dashing is to install a doggy playpen and gate INSIDE your front door. 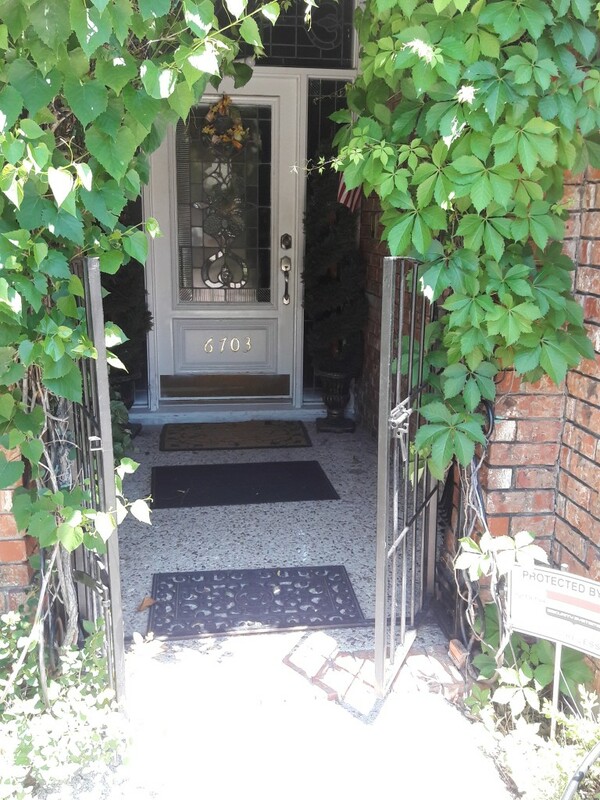 Establish a rule in your home that either the door or the gate is closed at all times. You could try to remove the rewards listed above, but good luck with that. The easier solution in this case would be to remove your dog from the rewards. Do everything you can to prevent your dog from being successful even one more time. Every time your dog is successful at the running out the door or gate, that success rewards the behavior and will encourage your dog to attempt the wrong behavior again, again, and again. Here’s a possible solution (one of many): Install an extra gate at your dog’s exit point. This is exactly the same strategy that zoos and petting zoos implement at their facilities. Install two entrances instead of just one, in order to minimize their creatures’ escaping. Install a doggy playpen and gate inside or outside your front door or side gate etc. to decrease the likelihood of your dog escaping. Please see the accompanying photos. Step #2 is, Teach your dog the behavior you want it TO DO instead of the behavior you don’t like. How about “Wait” at the front door? Every time, every time, every time — any questions? – every time you take your dog out the front door or side gate, have your dog wait first for 5 to 10 seconds before exiting. What becomes routine for you will become routine for your dog. What becomes habit for you will become habit for your dog. Guess what? If you, dear human, don’t have a routine, your dog won’t have a routine either. The safety gates don’t work if you don’t keep them closed at all times! “Wait” doesn’t mean “Stay.” “Stay” means “I want you to assume a specific body position for a specific amount of time.” “Wait” means stop forward motion momentarily until I release you with a release cue, e.g., “Let’s go” or “Free!”. If you need help with your dog running out the front door or side gate, call us TODAY! We can help! 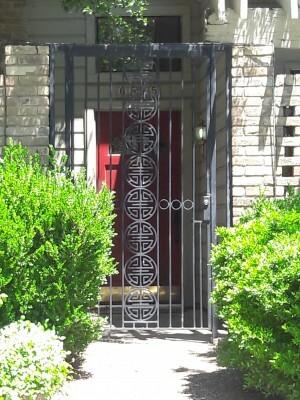 Examples of outdoor safety gates.